Again….a pretty easy one for Saturday. Atypically easy LAT for Saturday. LAT: 11:03, no errors; mercifully easy. WSJ: 26:41, no errors; a theme having to do with song titles (a couple of which I actually remembered 😜). Newsday: 37:37, no errors; did pretty well on it but, on another day, it might have stumped me completely. Up late last night, so I’m a bit underslept. LAT: 11:52, no errors. WSJ: 30:32, 1 crap shoot error (60A-61D). Basically almost all the answers, was the first thing that came to mind. Fun and easy, for a Saturday. NYT #0105 from my paper, I got a total of 4 answers and 2 of them were wrong. This was IMO one of the worst puzzles I have ever attempted to solve. Is it just me? and sometimes Thurs, but I realize I’m out of sync with Friday and Sat. a puzzle that will be unsolveable. 16:35. Easy by Saturday standards, but I still took a couple of minutes to get going on this one. 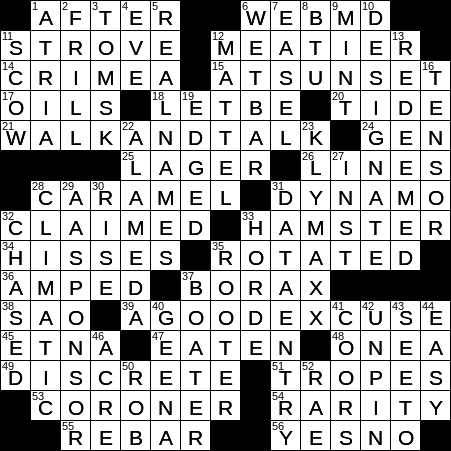 I started the NYT Saturday puzzle last night and just put it down. I was hoping I was just tired, but it really is that hard. @Jeff … The weather report for Denver is pretty good for the next few days. We had a little snow last Wednesday and some pretty cold nights afterward, but it’s warming up nicely now. I can’t speak for the city’s supply of Fat Tire, but I suspect they’ll have enough … 😜. 11 mins 49 sec, no errors. Easy for a Saturday. Easy peasy. More like a Wednesday puzzle. At first spelled “Horde” as ” Hoard” but quickly corrected. São José is Portuguese for Saint Joseph not Saint John. Now what do I do with the rest of this snowy Saturday afternoon in Central NY? Thanks for catching that error. Another case of more haste, less speed. All fixed now. Yes, easy one. The only area of trouble for me with the NW. Wanted ‘strife’ to fit for 11A but that never worked. So NW was incomplete. But still a fun puzzle. Thanks for correcting the heart anatomy! I had walking talk, but realized it was walk and talk. Fun puzzle! Nice and easy Saturday; took 27 minutes with no errors on paper. Just had to fix my poor spelling of DeSCRETE to make CLIMATIC work. Didn’t know Klymaxx but the crosses pulled it through. I watched the song on YouTube…it was okay. Klymaxx Song: Meeting in the Ladies Room much better song. Give that one a listen.